I am having way too much fun here in California with Kim Saulter! We fulfilled a dream and collaborated on a mini project together. 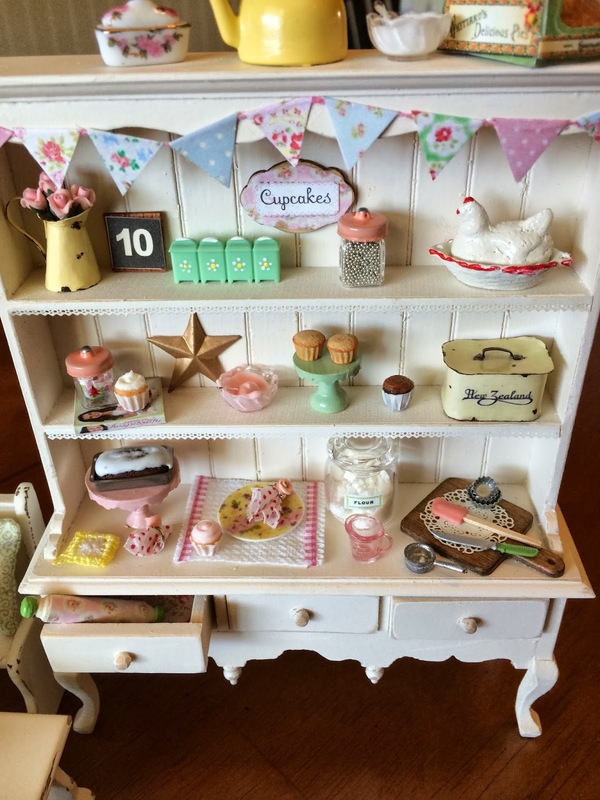 We created this 1:12 scale vintage baking hutch together. The cupcakes and pies made by Kim are there because we both love them! There's a pink spatula because I've been searching for one in the shops here. And of course we both love to bake! We've been hunting for vintage milk glass while I've been here. We couldn't stop creating so we added a kitchen nook table and benches! We also created a little kitchen baking table scene. We saw a very beautiful doll we wanted to buy for Liberty so Kim decided we should list our creations on Etsy. Here's a pic taken by Kim of us lunching together. We had been laughing so much we were crying...that's been happening a lot!! The Nylon's are here too! Off on an American adventure...more to come! Late nights, shopping, eating out and laughter with a wonderful friend! And still four more days of fun to go! Two years ago, before I went on my trip to Europe, I made a little scrapbook to leave as a surprise for Liberty. Making little scrapbooks is something else I love to do! 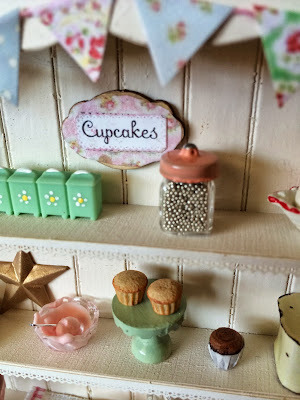 I started with a kraft paper pre-made book in a box by Bella designs. Each page had a pocket with a tag (or two) in it. Each tag had a date on it. Every morning I was away she would read the appropriate tag and it would tell her where to look in our house to find a little surprise present. Or some days there was an idea of somewhere she could go with her daddy. She loved the book and we still look at all the pages and she tells me what she did when I wasn't here. Two years later she still likes to remind me how sad she was when I was away! When I told her I was going away this year she straight away asked if I would make her another book. So I've spent the last few nights making a new book and I've had a great deal of fun finding little gifts to leave for her. I'll show you this years book when I get back. My mum used to leave little gifts for me whenever she went away and I loved that! Just two more days and I'm off on my next exciting adventure to visit Kim!! Working on the shed and travel plans! but I didn't want to show you until I'd made the windows. Now...I was hoping to get to my friend Anne's house so she could help me (she's a master builder!) but real life has been getting in the way! and yesterday at home with a few sticks of wood left over from other projects and my trusty craft knife I made the windows. I have big plans for this little shed! in two weeks time I'm crossing the world to visit another friend I've made through this blog. I'm so excited to be flying to California (that's 13 child free hours away from New Zealand on a plane!) to meet the incredibly talented Kim Saulter!!! We're going to have 9 fun filled 'shabbylicious' days together, I can't wait!